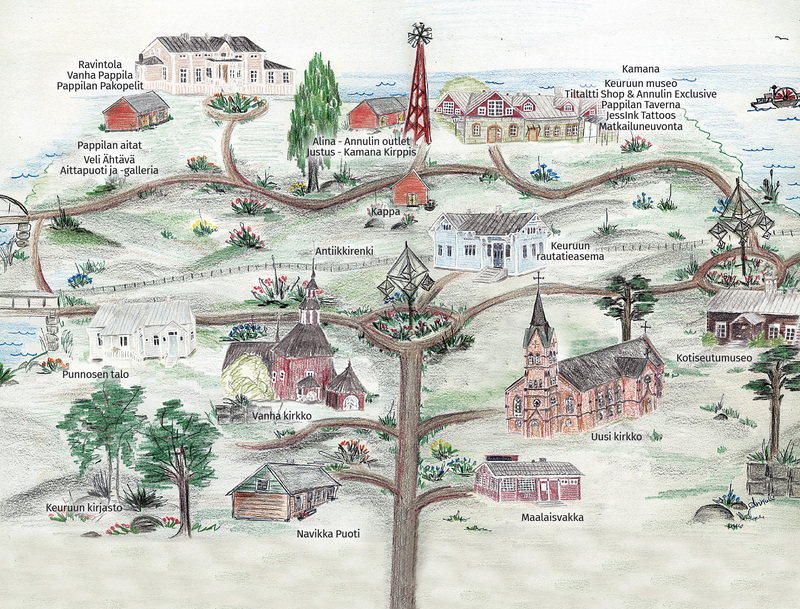 The old Keuruu area is located in Central Finland, just off the route no 23. The nearest airports are in Jyväskylä (70km) and Tampere (130km). By car: The easiest way to find us by car is to follow the official signs of ”Old Keuruu” from the main roads. The best place to park your can is by the old rectory (Kangasmannilantie 2-4) or at Keuruu railway station (Jyväskyläntie 1). Free parking is available at all of old Keuruu destinations. By train: Keuruu railway station is included in the old Keuruu area, so when arriving on a train, you’ll be right in the middle of it all. Keuruu can be reached with trains from Jyväskylä, Tampere and Seinäjoki. Search for timetables and prices in the VR website. By bus: Keuruu bus station is located at Koulutie 7 and it is pretty near to all old Keuruu destinations. Even the farest destinations are less than one kilometer away. Search for all finnish bus routes, timetables and ticket prices in Matkahuolto website. All the destinations and attractions are within walking distance of each other, and along the way you will find some old Keuruu direction signs which will guide you to the right place.